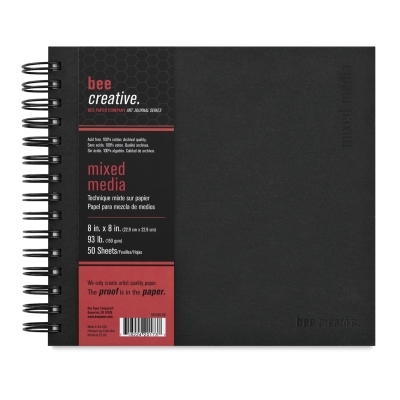 Make your artist journal as distinctive as your artwork! Bee Creative Mixed Media Books have sturdy black chipboard covers that can be decorated to suit your personality or your interests. Each book holds 50 sheets of acid-free, 93 lb (150 gsm) paper with a natural white color and excellent structure for mixed media. The paper features two distinct surfaces — cold press for dry media on one side, and a smoother hot press surface on the other side for pen-and-ink and mixed media. The pages are micro-perforated for easy removal. A double wire binding creates a flat working area, allowing artists to create across two pages. The extra heavyweight front and back covers are 100% recycled and provide a stable surface for field work.